This classic recipe is very easy to make, but it is also easy to do badly. Take care of the details and the dish will be outstanding. With very thin slices of pork, such as are used here, it is essential that they are cooked quickly at a high temperature, otherwise the dish will become watery. It is also important not to soak the pork in the soy-sauce mixture for too long or the meat will become tough. I am sure this dish, with its wonderful combination of soy, mirin, ginger, and pork, will be popular with everyone who tries it. Briefly freeze the pork, as this will make it easier to slice. Slice the pork as thinly as possible, then wrap the slices in plastic wrap. Tenderize by hitting the wrapped slices with a rolling pin. Remove the plastic wrap. Let the pork come to room temperature before cooking. Separate the white stems from the green leaves of the bok choy. Cut the stems lengthwise and the leaves in half. Blend the soy sauce and mirin together, add the grated ginger, and mix to combine. Put a little oil in a skillet over high heat. Stir in the bok choy stems, then the leaves, and stir-fry for 1 minute. Season with salt and pepper and arrange on the plates that will be used for the pork. 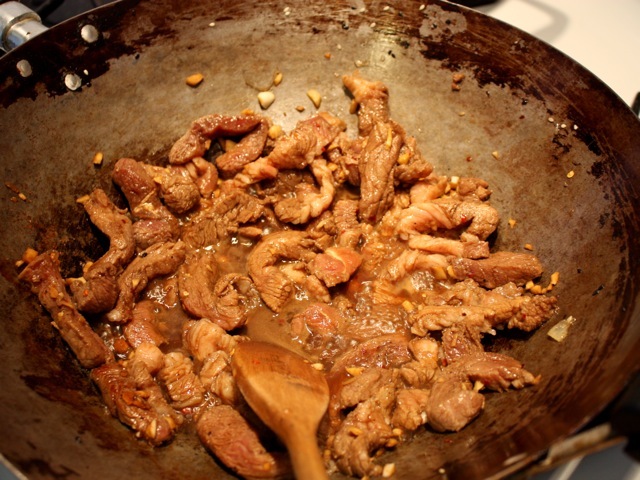 Dip the pork slices into the soy-and-ginger mixture and quickly brown in the hot skillet. Serve with the bok choy. Culinate editor's notes: You can use pork loin in place of the pork shoulder, and thereby skip the tenderizing step. This recipe is more like a meal for two or perhaps three hearty eaters than a main dish for four. Stretch it by doubling the amount of bok choy, and serve it over freshly steamed rice or stir-fried noodles.